Celebrating their first album since 2014, which drops Feb. 14, the same day they play Nashville for the first time in years, headlining The Basement East, Florida bred and now semi-local indie/alt rock fixtures Copeland have, with new effort Blushing, crafted their best record in years, and one that feels like a stunning encapsulation of the vast catalogue that came before it. 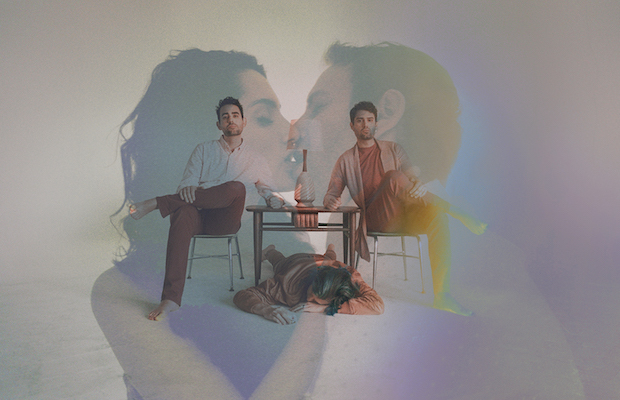 For their latest Music City outing, the band have recruited an inspired supporting lineup as well, with beloved California ambient indie project From Indian Lakes, and fantastic up and coming singer-songwriter Many Rooms, tapped to open things up. One of the most essential shows of the winter, tickets are still available right here while they last! Or, if you’d rather try your luck, we’re also giving away a pair of tickets to one lucky fan! Read on for more about the show, and enter for a chance to win below. It’s now been five years since Florida formed indie rockers Copeland sprung back to life after an extended hiatus, reconvening for their first album in six years, 2014’s excellent and underrated Ixora. Initially, the band, who had moved on to other projects and are now spread across different cities (including Nashville), seemed unable to tour, plotting only a handful of one-off shows, including a very incredible outing at Mercy Lounge back in early 2015. Met with overwhelmingly positive buzz, that handful of shows turned into a supporting tour with Paramore (which also stopped in Nashville), prompting Copeland to change their tune in regards to touring, embarking on their first proper headlining run in half a decade towards the end of 2015, once again bringing them back to Music City. Fronted by Aaron Marsh, Copeland formed nearly 20 years ago in Lakeland, Florida, quickly gaining a cult following for their lush, sad, and earnest 2003 debut Beneath Medicine Tree, and picking u broader critical and commercial traction with their more upbeat and slick 2005 sophomore effort In Motion. Combining soaring melodies, rock and roll bite, indie pop sensibilities, and deeply personal, earnest lyricism, the group maintained a passionate following until initially splitting up in 2010, and, four years later, managed to pick up right where they left off, albeit with somewhat more intermittent activity, likely thanks to other musical endeavors and personal life commitments. Though their future was much less in doubt this cycle, after a relatively quiet couple of years Copeland finally emerged from the studio late last year to announce a forthcoming new LP, Blushing, set to arrive Feb. 14 via Tooth & Nail, coinciding with their Nashville return. Meant to be a sort of encapsulation of everything the band have done before, albeit with heightened sensibilities of symphonic, rock, and electronic indulgences, each single released so far has been well-worth the wait, and has left us feeling like this is the new Copeland album fans have been waiting for for at least a decade. With sweeping range, lush arrangements, emotional vulnerability, and eclectic influence, Copeland have always been a dynamic band with a seasoned and engaging live show. In 2019, they feel just as important and essential as ever. Born a decade ago as a creative outlet for frontman, writer, producer, and sole recorded multi-instrumentalist Joey Vannucchi, From Indian Lakes was named for the small California town near Yosemite National Park where Joey grew up, largely isolated on 40 acres of land, and without electricity or common amenities, prompting him to spend his childhood honing his musical skill, reading, and pursuing creative endeavors. After positive reception to early demos, From Indian Lakes self-released their debut LP, The Man with Wooden Legs, in 2009, around which time Vannucchi assembled a live band made of up friends who’ve largely remained a fixture of the group since. With a lush, dreamy, layered, shoegaze-y, pop accessible, indie sound, which has varied greatly from one album to the next, From Indian Lakes gained even more attention and high-profile critical praise with their independently released sophomore effort, Able Bodies, in 2012, earning them a deal with Triple Crown Records. By 2014’s beloved wider breakthrough Absent Sounds, FIL were becoming one of the buzziest indie bands around, adored by a wide range of critics, and touring bigger spaces and in support of larger acts. Their most recent and fourth album, Everything Feels Better Now, recorded entirely using analog techniques, is perhaps From Indian Lakes’ best yet, landing on countless best of lists, and leaving us early anticipating a followup, which should be due sometime in the very near future. They’re a perfect compliment to Copeland, and a performer we’d recommend just as enthusiastically on their own! Since adopting the Many Rooms moniker, Columbus, Ohio by way of Houston, TX singer-songwriter Brianna Hunt has, over her 2015 debut EP, Hollow Body, and especially with last year’s stunning first full-length, There Is a Presence Here, forged her own style of earnest, sad, heartfelt, and soul-searching ambient and deconstructed indie rock, which would certainly resonate with fans of peers like Julien Baker or Phoebe Bridgers, without much sounding just like either of them, or like any of the number of young, earnest, reflective women who’ve deservedly come to dominate indie music in recent years. Grappling with relationships, religion, and a number of other existential quandaries, Hunt’s songwriting is beautiful and melancholy, as gutted and calming and deep as the best of Copeland’s early work. A artist you should absolutely be keeping an eye on, you really want to make a point to arrive early for this performance. Winner will be announced Wednesday, Feb. 13 at 12 p.m. CST, and will receive one pair of tickets. Good luck! Win Tix to Copeland at Basement East! Copeland, From Indian Lakes, and Many Rooms will perform Thursday, Feb. 14 at The Basement East. The show is 18+, begins at 8 p.m. (doors at 7 p.m.), and tickets are available to purchase for $20-25.